From a blog point of view, the big change this year was moving away from Windows Live Spaces, where I’d started out, to WordPress. I’d been wanting to make the move for ages but had been too lazy to do so, and also unwilling to lose all my old posts and traffic; luckily when MS made the decision to retire Live Spaces they made sure it was very easy to migrate all my old content to WordPress and for that I’m very grateful – it almost makes up for the shabby treatment Live Spaces users had been getting in the preceding years. I also got one of my biggest ever days from a blog traffic point of view during the controversy over the future of SSAS at PASS; I’m not even going to link to that particular post because it still gets plenty of hits and it’s something I’d prefer to move on from. It’s better to look forward to the undoubtedly cool stuff that will be coming with Denali rather than brood over any disappointment about what has happened, and one thing I’m certainly relieved about is that in 2011 there will be lots of cool stuff to blog about – at some points in the last year I’ve struggled to find anything new or interesting to blog about for SSAS (although as Greg Galloway has just shown, there’s still lots of interesting SSAS topics to blog about if you look). Bring on BISM! Professionally things go from strength to strength and I’m going to be busier in the first half of 2011 than I’ve ever been in January/February, which are usually relatively quiet times for me. Again, with significant new technology arriving in the BI stack in Denali I would expect a lot of consultancy and training work to follow; I’m going to be expanding my training activities in other ways next year too, and I’ll be making a separate announcement about that here any day soon. SQLBits also continues to grow and grown, and I’m really excited about the plans for SQLBits 8 in Brighton this April. Since it doesn’t look like there’s going to be a PASS Europe this year I would say that anyone who’s serious about SQL Server in Europe should plan to come to what’s going to be the biggest and best SQL conference in Europe bar none; and even if you live outside Europe, but fancy a vacation, why not come too? We have an ever increasing number of US attendees and speakers! Anyway, it’s time for me to go and do some real work and stop being self-indulgent. I hope everyone reading this has a great 2011. Thanks for reading! These changes are going to be very useful to anyone running a high-end SSAS implementation. We’ve also posted most of the videos from SQLBits 7, which are available to view for free from the SQLBits site at the link above. Stay tuned for more announcements about the exciting stuff we have planned for Brighton! It’s pretty simple: it allows you to visualise the number of occurrences of words in books held in Google books by year of publication, and therefore track the popularity of ideas and concepts over time (well, that’s the theory). You can even download the source data – if I’ve got some spare time it might be interesting to see this data in PowerPivot…! If you’re wondering what Dryad is, Daniel Moth has blogged a great collection of introductory links; and Jamie and I have been following Dryad for some time too. Although it seems like its integration with SSIS has fallen by the wayside its relevance for very large-scale ETL problems remains: it will allow you to crunch terabytes or petabytes of data in a highly parallel way. And given that you can now join Windows Azure nodes to your HPC cluster, it sounds like it’s a solution that can scale out via the cloud, making it even more exciting. I hope the people working on Microsoft’s regular and cloud BI solutions are talking to the HPC/Dryad teams. The ‘Country’ attribute in the ‘Customer’ dimension has a generated dimension security expression that is not valid. DimensionPermission (1, 2) The restrictions imposed by the CONSTRAINED flag in the STRTOMEMBER function were violated. Not good for debugging, and a bit confusing for your users if they see it. Also, in some implementations of dynamic security (for example if you’re not using the Constrained flag or using a Filter) instead of getting an error you’ll be able to query the cube but just see no data in it, which is even more confusing. This may all seem like window dressing, but it can save you time later on when you’re trying to debug security problems over the phone with users or other developers. 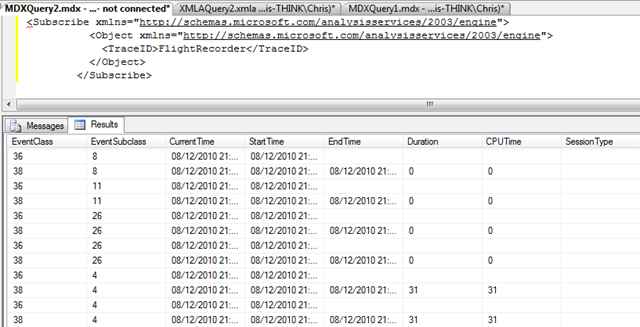 There’s a few blog posts out there that describe how to define and run server-side traces for SSAS (such as this one) but recently I was looking into how to subscribe to a server-side trace that’s already running, and while there’s a good thread on the forum I didn’t find much other information out there on the subject. Time for a blog post, then. I had thought this might be an easy-ish way of getting trace data into PowerPivot for analysis, but unfortunately as soon as you kill the session the subscribe is running on you see an error in the PowerPivot window. But it will work in SSRS if you use an OLEDB connection and can find an easy way of killing a session from inside an SSRS report – I’m sure it’s possible, using this technique, but it won’t be elegant. To be honest, though, in most cases saving the trace to a table in SQL Server, or to a file, will be more convenient if you want to use trace data for analysis.